New Delhi, March 21: Former deputy prime minister Lal Krishna Advani has not been named in the first list of candidates released by the Bharatiya Janata Party (BJP) on Thursday. 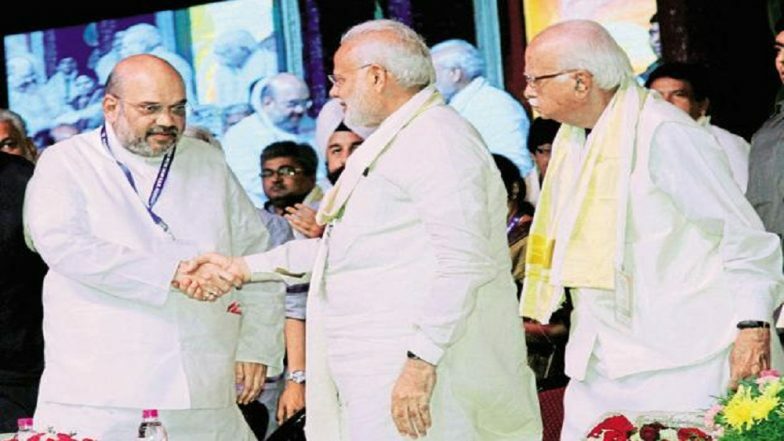 The Gandhinagar seat, which the BJP patriarch has been representing since 1998, has been allotted to the party's current president, Amit Shah. LK Advani not being named from Gandhinagar is an indication that he would not be issued a ticket in this general elections, opine pollsters. The 91-year-old, despite his super-seniority, has been a regular attendee of the Parliament sessions and was also heading the parliamentary panel on ethics during the tenure of the 16th Lok Sabha. Check Constituency-Wise Full List of Candidates Named by the BJP. BJP's Chief Election Committee (CEC chief JP Nadda, while reading out the list of 184 candidates, did not comment on whether Advani would be named from any other constituency. Apart from the BJP veteran, another senior leader - Murli Manohar Joshi - has not been named in the party's first list of candidates. The 86-year-old, who served as a Cabinet Minister during the Atal Bihari Vajpayee-era, is currently the sitting MP from Kanpur. However, no other candidate has been named so far from the constituency by the BJP.